Commenting on my Leaf Eater review, wise Pomona Belvedere of Tulips in the Woods reminded me to wear ear protection. She’s quite right. As someone who has a severe-to-profound hearing loss, I should know. And know better. Called presbycusis – a great word to file away for Scrabble or crossword clues – my type of loss is in the high frequencies, where consonants reside. Ps, Bs, Ts, and so on, are easily confused for someone with presbycusis. In short: we usually know that you’re speaking, but we might not get everything you say. A natural process of aging, it’s accelerated in my case by genes. It was detected in my teens and has progressively worsened; I’ve worn hearing aids for 25 years. But note this: Sudden or prolonged exposure to loud noise can also damage your hearing. Like my Leaf Eater, or your leaf blower or mower. Like the chainsaw (or, in the case of Kathy Purdy at Cold Climate Gardening, the reciprocating saw) you use for lopping or pruning. Or the circular saw you might be building your shed with. Or the music player you might wear as you do your weeding. Take it from me, you don’t want to lose your hearing. It’s an almost invisible disability, making it doubly difficult to live with. People get annoyed when you can’t understand what they’re saying. Alarm clocks, smoke detectors, telephones, going to see a play, conversing in a coffee shop; so many everyday things we take for granted can be challenges for the hearing impaired. It can be isolating, frustrating – and, for noise-induced hearing loss, can be largely preventable. 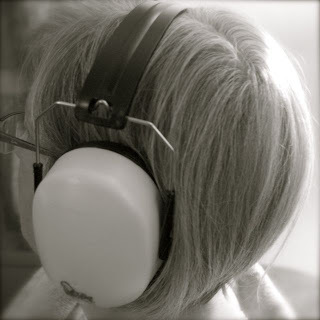 Please, check out the information at Dangerous Decibels or the Canadian Hearing Foundation. Wear ear protection when in noisy situations for long periods. Turn down the iPod and the TV. As our population ages, hearing loss will be one of the fastest-growing disabilities. Don’t you be among them, if you can prevent it. What? and "excuse me" These are common sayings around our house. I have partial hearing loss and I am glad you posted this warning! I think all those years of walkmans are to blame. Oh, yes, Rosey — I know of which you speak. The worst people to deal with for the hard of hearing can be your own family! From the lack of comments on this particular post, my guess is that most people think such a warning doesn't apply to them, or they're just not interested. People worry about straining they eyes, when it's their ears they should be concerned about. You don't know what you've got till it's gone! Great post! Both my husband and brother in law – both 40, don't have hearing like they used to. Blame it on all the loud music playing an shows that were cool at the time. I don't think it'll be too cool when they're in their late 40's and need to ask people to repeat themselves all the time! One municipality here in the greater Montreal area is about to out-law the use, by gardening services, of leaf-blowing machines because of the disturbance to to the tranquility of this town. No mention was made about saving the hearing of the workers. Review: My Bogs Boots are Friggin’ Fantastic!